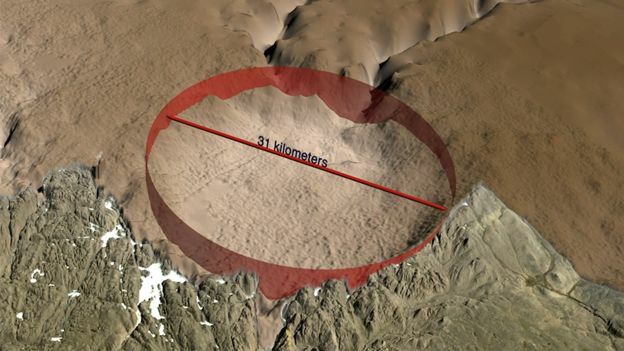 What looks to be a large impact crater has been identified beneath the Greenland ice sheet. The 31km-wide depression came to light when scientists examined radar images of the island's bedrock. 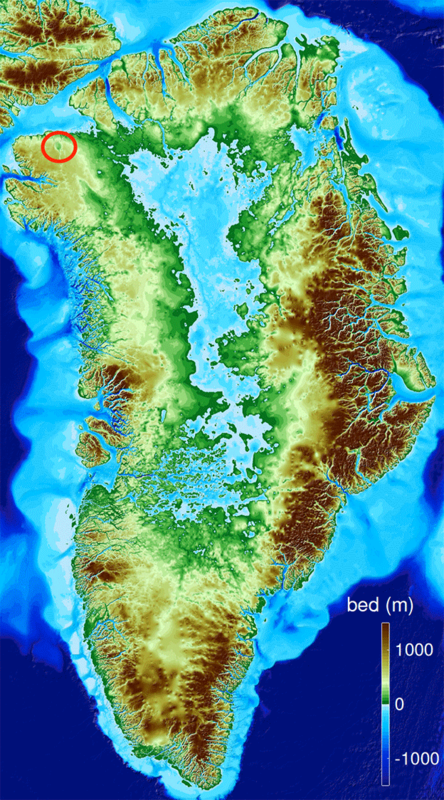 A map of the bedrock of Greenland. But without drilling through nearly 1km of ice to sample the bed directly, scientists can't be more specific. "We will endeavour to do this; it would certainly be the best way to get the 'dead fish on the table', so to speak," Prof Kurt Kjær, from the Danish Museum of Natural History, told BBC News. 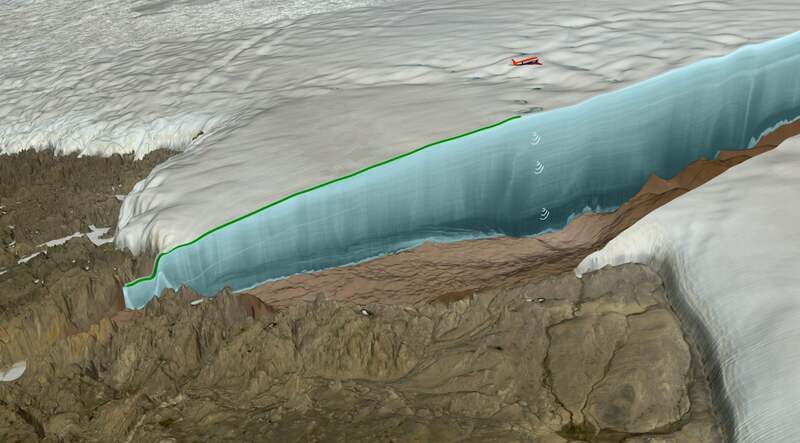 In a remote area of northwest Greenland, an international team of scientists has made a stunning discovery, buried beneath a kilometer of ice. It’s a meteor impact crater, 300 meters deep and bigger than Paris or the Beltway around Washington, DC. It is one of the 25 largest known impact craters on Earth, and the first found under any of our planet’s ice sheets. 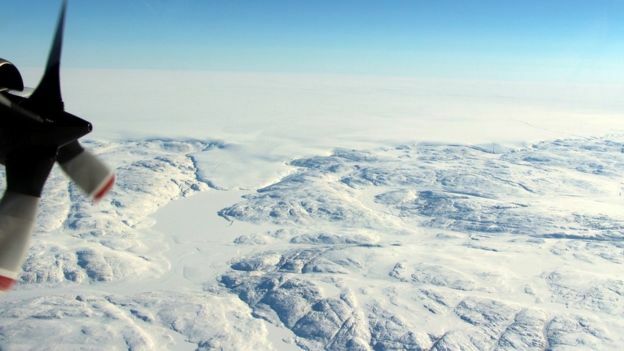 The researchers first spotted the crater in July 2015, while they were inspecting a new map of the topography beneath Greenland's ice sheet that used ice-penetrating radar data primarily from Operation IceBridge, an ongoing NASA airborne mission to track changes in polar ice, and earlier NASA airborne missions in Greenland. 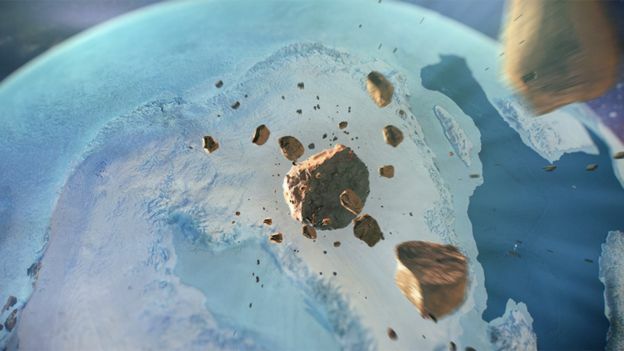 If confirmed, the crater would be the first of any size that has been observed under one of Earth's continental ice sheets. The discovery is reported in the journal Science Advances. What does the crater look like? 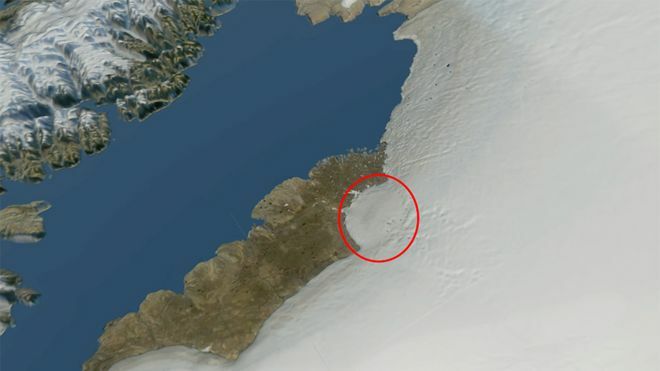 The putative impact crater is located right on the northwest margin of the Greenland Ice Sheet, underneath what is known as Hiawatha Glacier. Additional high-resolution radar imagery gathered by Prof Kjær's team clearly shows a circular structure that is elevated at its rim and at its centre - both classic traits. 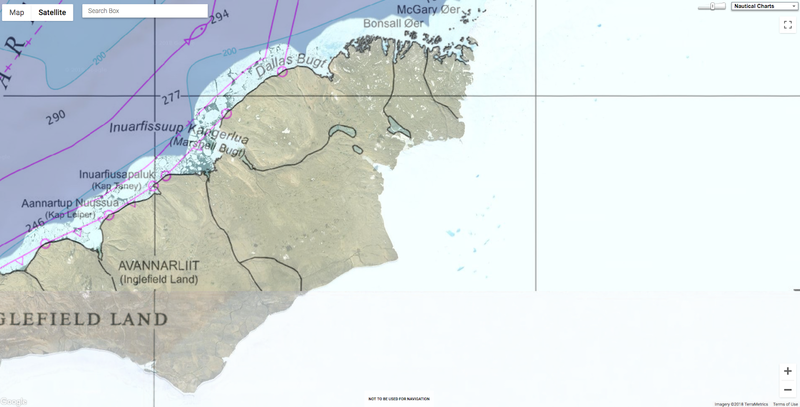 But because the depression is covered by up to 980m of ice, the scientists have so far had to rely on indirect studies. Meltwaters running out from under Hiawatha Glacier into the Nares Strait carry sediments from the depression. In these sediments are quartz grains which have been subjected to enormous shock pressures, of the type that would be experienced in an impact. 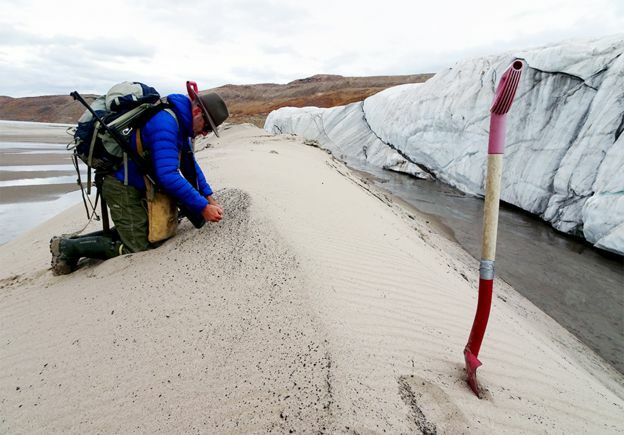 Other river sediments have revealed unusual ratios in the concentrations of different metals. "The profile we saw was an enrichment of rhodium, a depletion of platinum, and an enrichment of palladium," explained team-member Dr Iain McDonald, from Cardiff University, UK. "We got very excited about this because we realised we weren't looking at a stony meteorite, but an iron meteorite - and not just any old iron meteorite; it had to be quite an unusual composition." Such metal objects that fall to Earth are thought to be the smashed up innards of bodies that almost became planets at the start of the Solar System. The signatures identified by Dr McDonald are relatively close to those in iron meteorite fragments collected at Cape York not far from the Hiawatha site. It's not inconceivable, the team argues, that the Cape York material represents pieces that came away from the main asteroid object as it moved towards its collision with Earth. One concerns the absence of any trace of the impact in several cores that have been drilled through the ice sheet to the south. At the very least, these might have been expected to incorporate the dust that fell out of the sky after the event. The other head-scratcher is the absence in the vicinity of the Hiawatha site of any rocky material that would have been ejected outwards from the crater on impact. Prof Kjær says these missing signatures might be explained by a very shallow angle of impact that took most of the ejecta to the north. And if the fall-out area was covered in ice, it's possible any debris was later transported away. "We know that at one time the Greenland Ice Sheet was joined to the Canadian Ice Sheet, and flowed out into the Nares Strait. 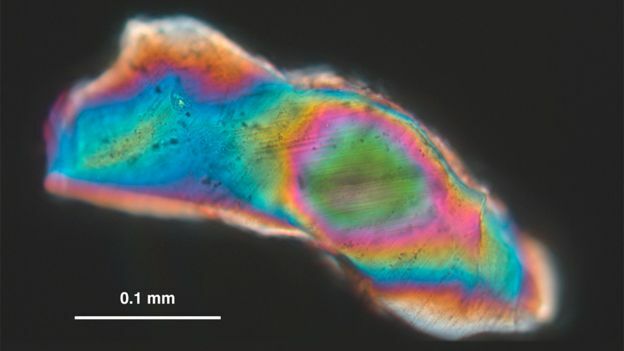 If you wanted to find this material today, you'd have to do deep drilling in the ocean," Prof Kjær explained. A view of the bedrock below the ice facing northwest, toward the sea, shows the terrain of the crater. In addition the rim surrounding the feature, the researchers behind the discovery also spotted a slight rise in the center. What are the age constraints? The team knows the crater must be older than roughly 12,000 years because the undisturbed ice layers above the depression can be lined up with the layers in drill cores that have been directly dated. And they estimate an age younger than three million years based on an assessment of likely rock erosion rates, both within the crater and on nearby terrains. But the only way to get a definitive age for the crater would be to drill down and collect rocks for laboratory dating. How does this connect with other ideas? An illustration of an airplane using radar to map the topography below the ice sheet. Some have argued that an asteroid impact could have been responsible for this cooling blip - and the accompanying extinction of many animal groups that occurred at the same time across North America. Others, though, have been critical of the hypothesis, not least because no crater could be associated with such an event. The Hiawatha depression is likely now to fan the dying embers of this old debate. Dr Mathieu Morlighem, a team-member from the University of California, Irvine, US, commented: "When you think about it, the bed below the ice sheets has to have impact craters that have not been explored yet, and there may even be some in Antarctica as well, but more radar measurements are necessary to locate them, and dating them is extremely challenging."